Shapely physiques are built on muscles. Some people desire the bulging biceps and ripped abs of a bronzed Adonis, while others just want the confidence of looking lean and toned, and others want added muscle to help with fat loss. Whatever your physique or fitness goal, the solution usually revolves around “Planet Muscle”. Getting stronger, bigger, more toned, having increased muscle mass fueling fat burning all require numerous complex physiological changes to muscles, one of which is hypertrophy. So, just what exactly is going on under your skin? Geraldine Campbell explains. Hypertrophy is the increase in skeletal muscle mass and cross-sectional area in response to work done against resistance, e.g., exercise. Skeletal muscles are mainly made up of myofibrillar proteins, which allow muscles to contract. The enlargement of these myofibrillar muscle fibers causes the increase in muscle size following resistance training. This increase in size (or ‘hypertrophy’) contributes to the increase in strength through repeated training. 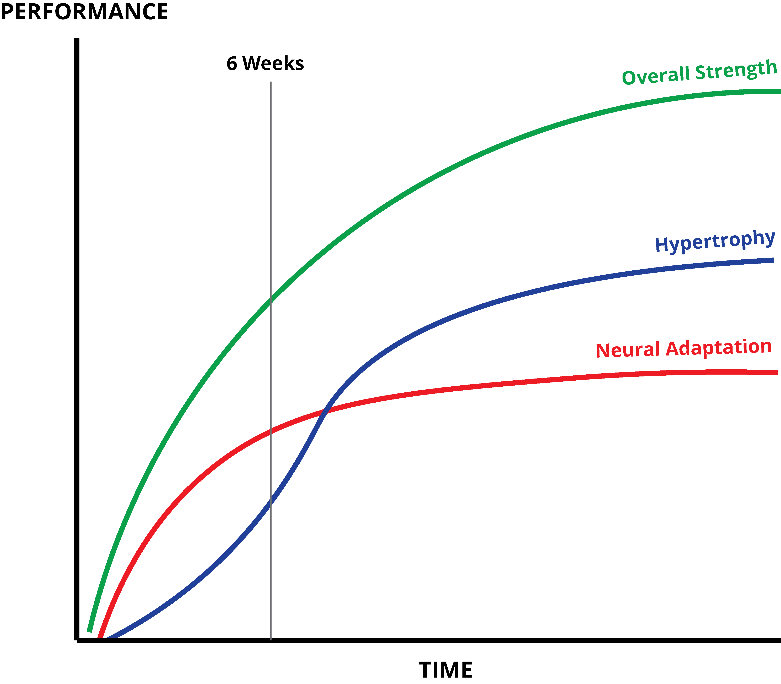 As shown in the graph below, hypertrophy contributes more to overall strength after initial neurological adaptations (changes in the structure and function of nerves) have occurred in the muscle. Different intensities of exercise will influence which type of muscle fiber increases in size. FitnessGenes recommends training volumes (set/reps/tempo) based on your genotype to produce a stimulus that will induce optimal hypertrophy of your muscle fibers! 3. Inducing muscle damage - as you overload your muscles or push them to fatigue, you’ll cause some microtears. During the recovery process - when combined with proper nutrition and rest - these tears will cause hypertrophic adaptations to the muscle fibers. Fatiguing the muscles to stimulate growth may also induce what is called ‘sarcoplasmic hypertrophy’ - the increase in the volume of fluid and non-contractile proteins (e.g., water and metabolites) in muscle. While this can temporarily increase the size of the muscle, it does not necessarily lead to increases in muscular strength. Skeletal muscle hypertrophy is not just important for those concerned with their aesthetics. Increasing your muscular strength aids protection of your joints. Increasing your fat-free mass will boost your metabolism. Improved strength will not only improve your exercise performance but help with everyday tasks such as lifting objects. So please don’t think of hypertrophy as just your muscles growing in size. See it as a necessary process for you to increase your strength, lead a more functionally healthy life, and slow down some of those irritating age-related declines! You notice muscle gains in the mirror, but what’s happening beneath your skin to cause the growth? Hypertrophy occurs through the activation of various molecular signaling pathways. Found in our muscle cells, mTORC1 is one of the important molecules in these signaling pathways. It recognizes the physiological signals triggered by stress caused by exercise, and in response, increases muscle protein synthesis to keep the balance positive. As muscle synthesis is greater than muscle breakdown, the result is muscle growth. When you exercise, mTORC1 senses the changes occurring in your muscles. It influences target proteins downstream (activating (p70)S6K1 and inhibiting 4E-BP1) resulting in increased muscle protein synthesis, which increases muscle fiber size and cross-sectional area of the muscle, yielding well-earned muscle gains! The more you exercise (with adequate rest and proper nutrition), the more gains you will reap. Each bout of exercise activates these signaling processes and increases muscle protein synthesis and the expression of associated genes. The frequent short-term upregulation of these genes leads to accumulation of more protein in the form of muscle fibers. In turn, this leads to the increased size and cross-sectional area of muscle which defines hypertrophy. This pathway of mTOR to activate protein synthesis is also stimulated by the presence of amino acids, particularly the essential amino acid leucine. Consuming protein following resistance exercise elevates the rate of muscle protein synthesis, amplifying muscle growth and strength through the maintenance of a positive protein balance for longer. How can knowing your genetic make-up help? Lifestyle factors, such as how you train and what you eat, clearly affect muscle size. But that’s far from the whole story. Your DNA has a massive role to play too. Your genetics influence your intrinsic responses to hypertrophic stimuli such as resistance exercise or amino acid consumption. Based on your genes, we can broadly group individuals into ‘high responders’ or ‘low/non-responders’, or those who will experience greater hypertrophy after resistance training and those who may experience no change at all! Studies have shown linked this variation of hypertrophic response to genes such as IL-15 and IL-15R. Here at FitnessGenes, we test for a variant of the IL-15Rα gene. Carriers of two A alleles may experience greater hypertrophy responses in their muscles following resistance exercise but lower overall strength gains. 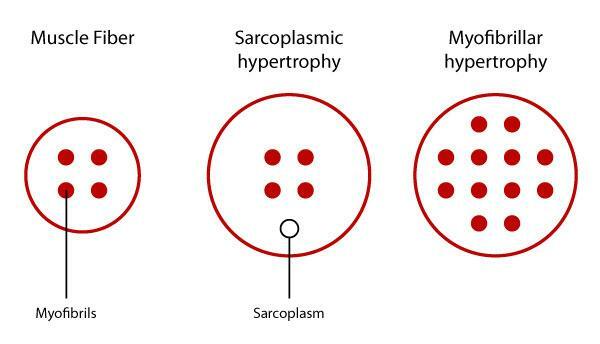 This would indicate that those carrying this genotype experience sarcoplasmic hypertrophy (increase in muscle size due build-up of fluid volume) more than the myofibrillar hypertrophy (increase in muscle fiber size) required for the increases in muscular strength. We adapt our training recommendations based on such genetic factors to help you maximise your hypertrophy AND strength adaptations from training! So, whether you’re after a Hulk-like physique or better muscular protection of your joints, FitnessGenes can help. Russell, B., D. Motlagh,, and W. W. Ashley. Form follows functions: how muscle shape is regulated by work. Journal of Applied Physiology 88: 1127-1132, 2000. Folland, J.P. and Williams, A.G., 2007. Morphological and neurological contributions to increased strength. Sports medicine, 37(2), pp.145-168. Goldberg, A.L., Etlinger, J.D., Goldspink, D.F. and Jablecki, C., 1975. Mechanism of work-induced hypertrophy of skeletal muscle. Medicine and science in sports, 7(3), pp.185-198. Bodine, S.C., Stitt, T.N., Gonzalez, M., Kline, W.O., Stover, G.L., Bauerlein, R., Zlotchenko, E., Scrimgeour, A., Lawrence, J.C., Glass, D.J. and Yancopoulos, G.D., 2001. Akt/mTOR pathway is a crucial regulator of skeletal muscle hypertrophy and can prevent muscle atrophy in vivo. Nature cell biology, 3(11), pp.1014-1019. Drummond, M.J., Fry, C.S., Glynn, E.L., Dreyer, H.C., Dhanani, S., Timmerman, K.L., Volpi, E. and Rasmussen, B.B., 2009. Rapamycin administration in humans blocks the contraction‐induced increase in skeletal muscle protein synthesis. The Journal of physiology, 587(7), pp.1535-1546. Atherton PJ, Etheridge T, Watt PW, Wilkinson D, Selby A,Rankin D, Smith K & Rennie MJ (2010). Muscle full effect after oral protein: time-dependent concordance and discordance between human muscle protein synthesis and mTORC1 signaling. Am J Clin Nutr 92, 1080–1088. Mero, A., Leikas, A., Knuutinen, J., Hulmi, J.J. and Kovanen, V., 2009. Effect of strength training session on plasma amino acid concentration following oral ingestion of leucine, BCAAs or glutamine in men. European journal of applied physiology, 105(2), p.215. Norton, L.E. and Layman, D.K., 2006. Leucine regulates translation initiation of protein synthesis in skeletal muscle after exercise. The Journal of nutrition, 136(2), pp.533S-537S. Timmons, J.A., 2011. Variability in training-induced skeletal muscle adaptation. Journal of applied physiology, 110(3), pp.846-853. Riechman, S.E., Balasekaran, G., Roth, S.M. and Ferrell, R.E., 2004. Association of interleukin-15 protein and interleukin-15 receptor genetic variation with resistance exercise training responses. Journal of Applied Physiology, 97(6), pp.2214-2219.